Contrary to our posts of the last few days, the market seems to be in the midst of a big correction finally. Or at least that's what the market and media tells us as the market closed today. Polls on CNBC showed that 60%+ plus investors expect a 10%+ correction and nearly 30% expect a 20%+ loss. Just another indication of how bearish the market has become. Down 6 of 7 days and 7 of 9, its surprising how few 'experts' have suggested buying this dip. One indicator that highlights the extreme negativity is the NYSE McClellan Index. At the close of today it ended at -114 or basically the same level as the end of February which is right before the market bottomed. The low number in the last year plus was just below -125 in October of last year. Those were some brutal moments in this market and indicative of how negative the market tone has become now. 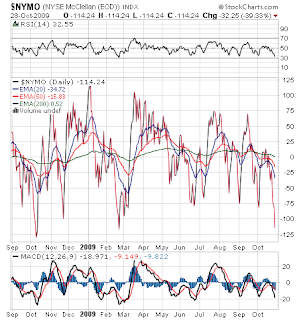 Its no clear cut indication that the market will turn tomorrow, but it does provide support to the theory that the market is short term very oversold. With markets such as the SP500 technically breaking below key resistance levels, it does add up to an interesting trade. A lot of traders closed out long positions or initiated short positions based on that breakdown. Since the market tends to trade against conventional wisdom, it wouldn't surprise us one bit if it turned on a dime tomorrow and closed back above the support levels leaving traders stuck after assuming the long last correction was upon us. Even though, it's been clearly shown that new bull markets last along time and they never correct at year end. Will this be the trend breaker? If it isn't the correction, look for hedge fund managers to really chase into year end. Anybody out of the market will be forced to join in setting up the final 'melt up' that we've been expecting to at least 1,150 or 1,200.